In 1883, the Thorens family business was first registered Switzerland by Hermann Thorens. An initial producer of musical boxes and clock movements, they started producing Edison-type phonographs in 1903. In 1928, they produced their first electric (motor-drive) record player, and went on to produce a range of audiophile record players in the 1950s and 1960s which are, even today, regarded as high-end audio equipment, and are much sought-after. 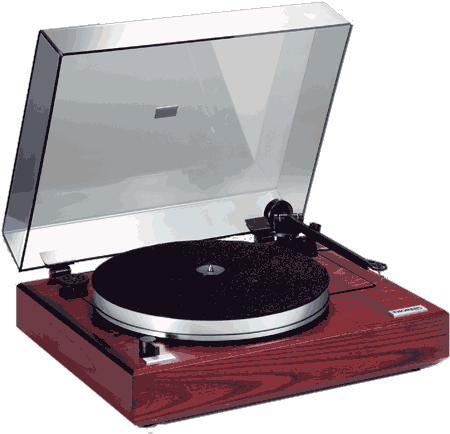 As of 2006, Thorens continues to produce well-regarded turntables for playback of vinyl and 78rpm gramophone records. The tonearm on this table features a low-mass tonearm with high-quality, low- friction bearings technology that rests in ball races by means of hardened and polished steel needles. The same technology can also be found in navigation instruments (gyro) employed in aerospace. to improve trackablity, and reduce record ware to keep your recording sounding their best. The tone arm is ulta low mass and that combined with a low mass phono cartridge such as a Ortofon with do great job with records tracking worped records. We also found that the arm lifter has a nicely dampened cue for manually playing your selections on your records and lifts and lowers nice and gently without any possibly of damaging either your records or stylus. 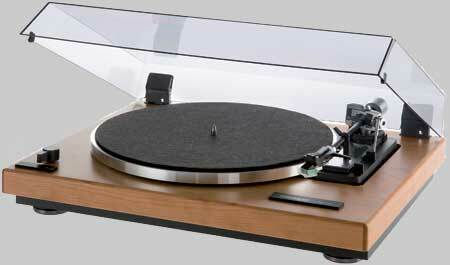 The Thorens TD-240-2 should be the first choice for anyone desiring a high-quality table to play back their treasured vinyl records, but is also looking for the convenience of Fully-Automatic operation. Stop by The Stereo Shop today for a demonstration! Turntables have certainly come a long way since they were introduced as the main source for playing back your prized recordings. This new Thorens TD-309 turntable is a prime example of what is now possible to extract virtually every last nuance of music. When you first glance upon the Thorens TD-309 it doesn’t appear like a conventional turntable; that is simply because it is not! The plinth is finished in an eye-catching, vibrant high-gloss red, (high-gloss black and white are available as well), and is shaped in a non-traditional shape, similar to an arrow or triangle. The table is suspended with three spring loaded isolation feet which helps keep the record playing properly even when you walk around the room, or have the table placed close to a powered subwoofer. The reason that three feet are used instead of four is because Thorens has discovered that is more effective to utilize three points of isolation instead of four. The platter is a thing of beauty as well; it is a very heavy, thick platter crafted from fused silica. By incorporating a heavier platter offers has many performance advantages, including, keeping the speed rotation smooth and accurate by creating a "flywheel" effect. Underneath the platter where the drive motor resides, you will notice something different on how the motor is attached to the tables’ plinth. The motor is supported in a cut-out in the main part of the plinth by a plastic "insert" that positions the motor off-center in the cut and then by another "spider" suspension, (similar to what is used in a speaker). This offers two benefits, first, you can apply tension to the belt by rotating the plastic insert to compensate as the belt starches over time with increased use, and the second benefit is that any motor vibration is isolated by the spider suspension. It’s a simple, but a very clever idea! The tonearm is an entirely new design manufactured by Thorens themselves, and not simply a "borrowed" or "rebadged" unit that many other companies will simply outfit on their tables! The TP-92 tonearm has considerable amounts of thought and engineering incorporated into this wonderful arm. It is a low mass arm fabricated from rolled aluminum, with high quality, low friction gimbals to help extract every last detail from your records. 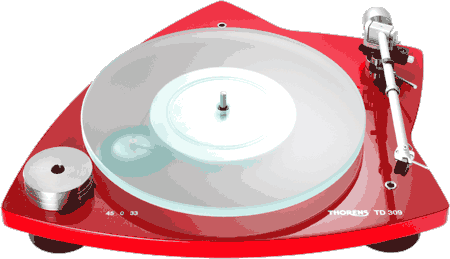 The Thorens TD-309 turntable has been outfitted with a phono cartridge, or we can upgrade your record playing enjoyment to an even higher level by fitting an Ortofon 2M Series, or GRADO cartridge and have it custom calibrated by our trained service technician that has over 50 years of experience setting up turntables. Thorens vast knowledge, with well over 100 years of manufacturing beautiful sounding, high-quality, turntables are shown here in all its glory. If you are in the market to add a nice table into your system, or if you are looking to upgrade your present turntable, you owe it to yourself to come down and see what the Thorens TD-309 is all about!